418 pages | 43 B/W Illus. Foodborne Diseases: Case Studies of Outbreaks in the Agri-Food Industries defines the context of foodborne disease across a range of food sectors. It provides insight into the causes and management of outbreaks along with practical lessons about foodborne disease prevention strategies relevant to stakeholders throughout the food supply chain. 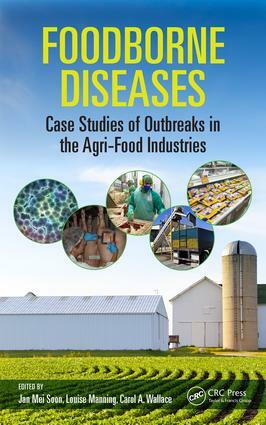 Individual chapters capture the epidemiological and traceback investigations of foodborne disease outbreaks in a wide range of food sectors that include fresh produce, dairy and eggs, and meat products, to complex food ingredients and products within the food manufacturing and food service sectors. Under each food category, case studies of real outbreaks are presented, along with lessons learned in the way they were managed for future control of foodborne disease outbreaks. The authors look at management of outbreaks across borders and consider how both local and international authorities dealt with the issues in each case. They focus on real-life microbiological/chemical-associated outbreaks and provide insights on how the outbreaks occurred and, if possible, how they were traced to the source of contamination. Each outbreak is unique, and readers are given the distinctive circumstances associated with different hazards, challenges faced during epidemiological and environmental investigations, risk communication to the general public, and insights into outbreak management. The authors cover the entire food supply chain, including a chapter on animal feed safety. A chapter on fraud and foodborne outbreaks considers scenarios where food industries, food services, and other stakeholders commit food adulteration, which ultimately leads to foodborne illnesses. Outbreak management and prevention strategies are key parts of each case study. Jan Mei Soon, PhD, is a lecturer in food safety management system at the International Institute of Nutritional Sciences and Applied Food Safety Studies, School of Sport and Wellbeing, University of Central Lancashire, Preston, United Kingdom. She is recipient of the 2010 Young Scientist John Coppock Award and the John Hawthorn Memorial Award, United Kingdom Federation for Food Science and Technology (UKFFoST), the 2011 IAFP Student Travel Award, and the 2015 Young Researcher Initiative Award from European Food Safety Authority. Dr. Soon has published papers in international peer-reviewed journals. Louise Manning, PhD, has worked in the food industry for nearly 30 years in a range of roles and sectors of the supply chain. She studied the development of a quality assurance model for broiler meat production as her PhD thesis. Dr. Manning is a 2007 Nuffield Scholar, having studied water policy and the role of markets in delivering water management. Her work is in the area of food policy and governance including food integrity, corporate social responsibility, and improving food supply chain performance. She is a senior lecturer at Harper Adams University, Edgmond, Newport, United Kingdom. Carol Wallace, PhD, is Professor of Food Safety Management Systems and co-director of the International Institute of Nutritional Sciences and Applied Food Safety Studies, School of Sport and Wellbeing at the University of Central Lancashire, Preston, United Kingdom. She earned a PhD for her study of factors impacting hazard analysis and critical control point (HACCP) effectiveness and continues to work closely with international food companies and organizations for the ongoing improvement of food safety standards. She is course leader for postgraduate food safety and HACCP programs and leads research themes in food safety effectiveness.